The patented (US Pat. No. 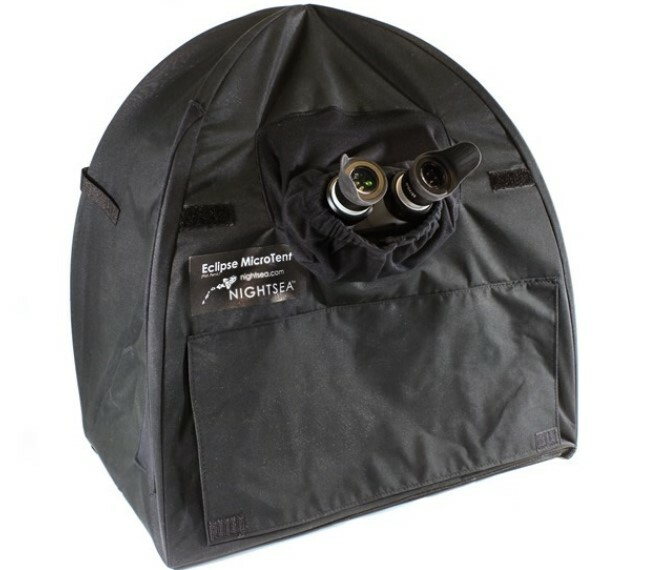 10,175,467) Eclipse MicroTent™ is a unique product for fluorescence microscopy that provides local darkness around conventional laboratory stereo microscopes. Fluorescence microscopes are kept in dark rooms for good reason - fluorescence can be weak and in many cases it can be difficult to see well if there is any ambient light. Microscopes may be on lab benches in shared spaces, near windows, or in other difficult-to-darken locations such as in the field. Turning off overhead lights can help but inconveniences others. 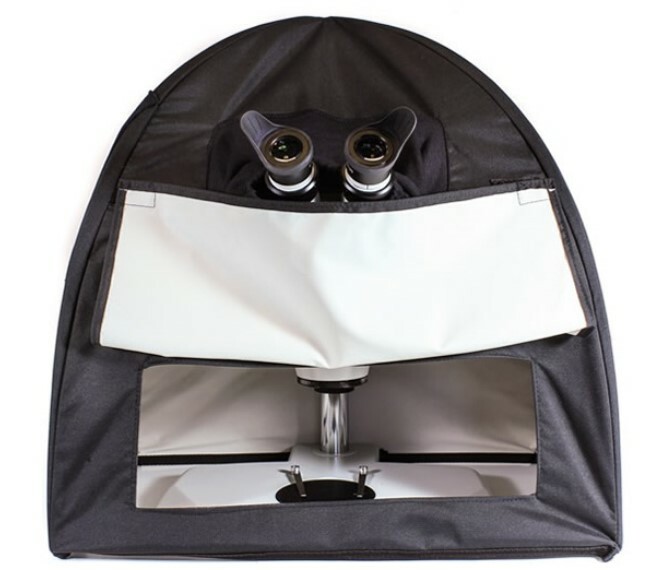 The Eclipse Microtent™ creates local darkness around a microscope while still providing easy access to the sample stage and the focus and zoom controls. 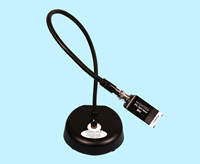 It is designed for stereo microscopes but could potentially be used with many varieties of compound microscopes. Please contact us if you require a custom-sized tent. Light entering your eyes from the side can interfere with what you want to see in microscopy in general, and fluorescence microscopy in particular. Eye cups are available, but the standard ones don't extend far from the microscope and don't do a good job as ambient light increases. 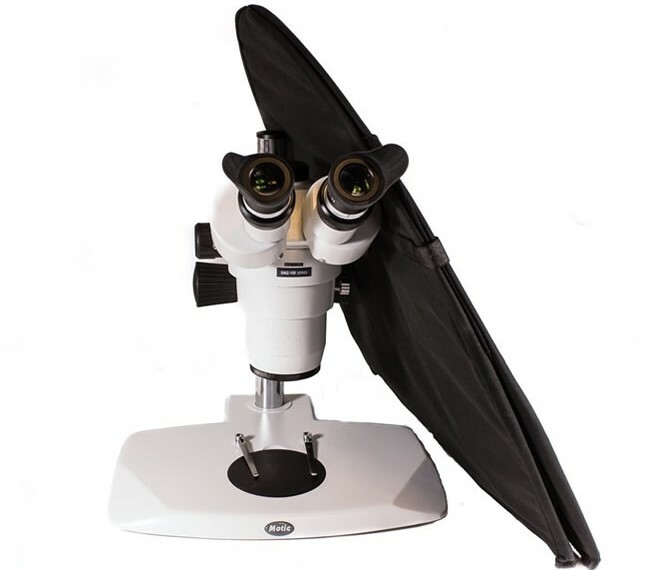 Our soft, molded rubber high-sided microscope eye shields are the answer. The tall wings extend up far enough to truly shield your eyes from any level of ambient light and eliminate distractions so that you can see your subject better. Two pairs (one Standard, one Compact) will be included with every Eclipse MicroTent™, and you can also purchase them separately. 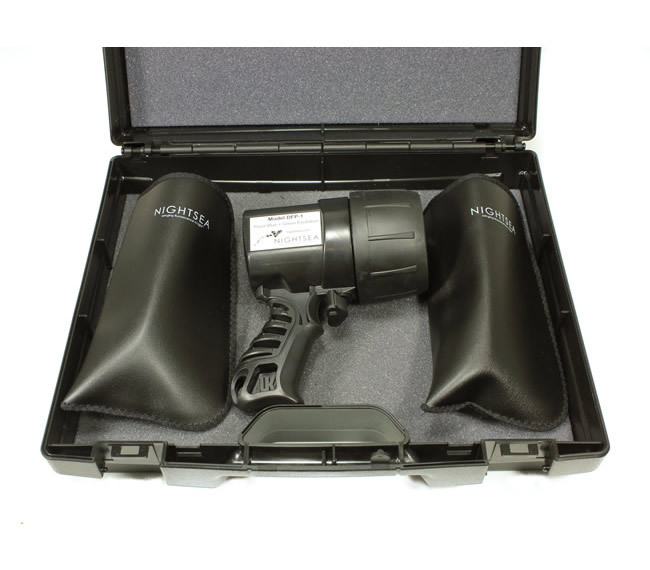 This is an extremely convenient option for general illumination and as a focusing aid for fluorescence imaging. 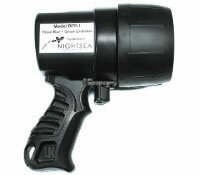 Now if you are using the NIGHTSEA system for fluorescence you do not need a separate white light source. Just exchange the fluorescence excitation light head module for the white-light module in a matter of seconds. Researchers sometimes need an infrared light source for non-intrusive observation of behavior. And sometimes the subjects are small and you need to make the observations with a stereo microscope. 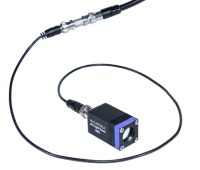 The SFA-LH-IR850 is an 850nm light source that is compatible with the NIGHTSEA Model SFA Stereo Microscope Fluorescence Adapter. 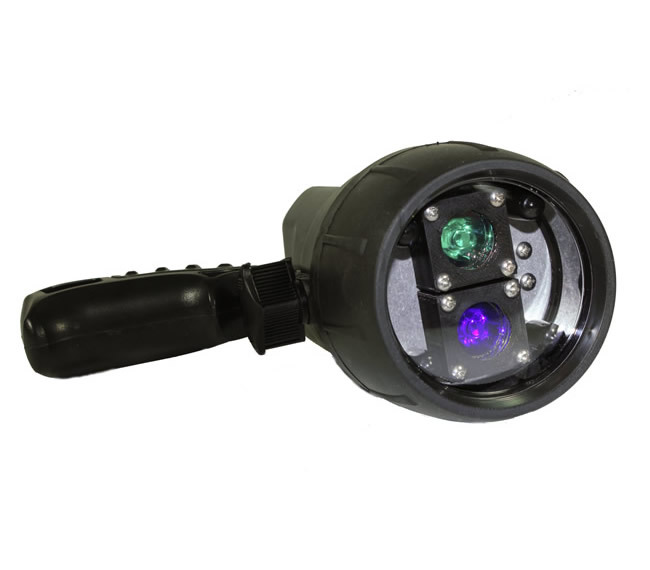 The light head plugs directly into the lamp base supplied with the SFA system. You can acquire the light head as a supplement to the SFA system that you already own for fluorescence observation, or you can acquire it in combination with a lamp base as a stand-alone device. The light head incorporates a high power 850nm LED and a medium beamwidth diffusing lens to create a smooth illumination area. 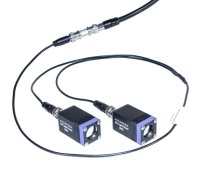 The output is centered at 850nm with a FWHM (full width at half maximum) of approximately 50nm. 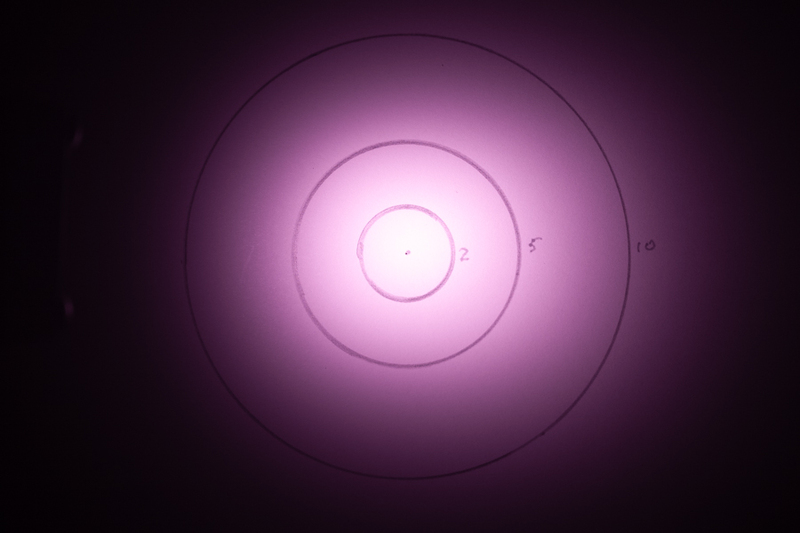 There is virtually no emission at wavelengths shorter than 750nm. 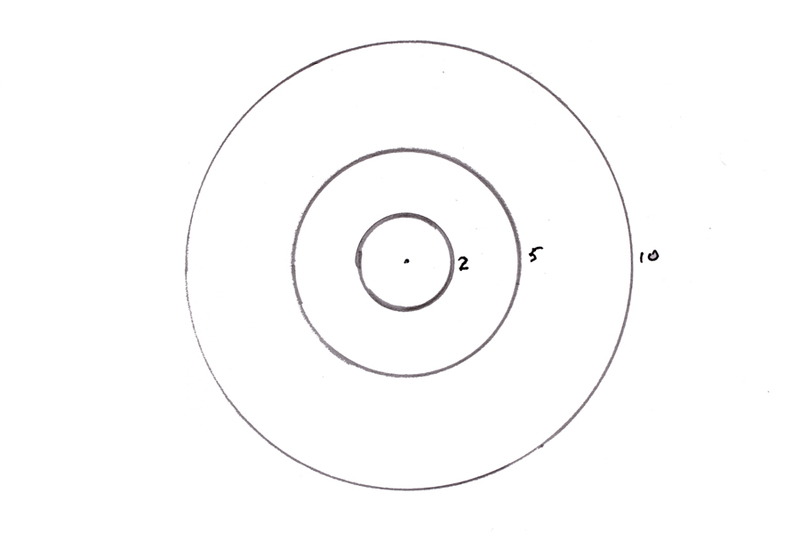 The first image to the right shows a test target with circles of 2, 5, and 10cm diameter. This photograph was taken with a conventional camera under normal room light, and with the IR light head illuminated at full power, directed at the target center from a distance of approximately 10cm (4 in.). The illumination spot is not visible either to this camera or to the naked eye. The secind image to the right is a photograph made under the same lighting conditions, but with a camera that had been modified to image only infrared light. We recommend that you use the DIM base with the LH-IR850 in order to have finer control of illumination intensity. Please note that infrared light is not visible to the human eye and to many cameras. You will need an appropriate camera to record the observations. 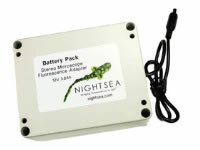 Compact battery pack that can run the Stereo Microscope Fluorescence Adapter (SFA) all day long. The battery enables truly portable operation so that you can set up demos anywhere or explore fluorescence in the field, without having to worry about plugging into the power grid. Just plug the battery into the SFA base instead of the usual power connector. The battery has been tested at over 8 hours of continuous operation, and it will last even longer if you turn the system off when you don't need it. Plug it into the included charger overnight to recharge. Combine the battery with the Eclipse MicroTent and you not only don't need a place to plug in, you don't even need to be in the dark! We have used this combination to do fluorescence microscopy at a beach in the middle of the day, in the desert at high noon, and more. Fluorescence can be found everywhere, and now you have the tools to go there. The NIGHTSEA light head hangers and cables conveniently hold the light head in lieu of the gooseneck lamp. The hangers mount to the end of any of the thumbscrews on the SFA adapter ring. They are available with two different pivot arm lengths for use with long and short working distance microscopes. The cables are available in single and dual styles. With the single cable and one light head hanger you can remove the light head from the gooseneck and mount it on the SFA adapter ring. With the dual cable you can power TWO light heads from one base. Just add a second light head and two light head hangers and you have double the excitation intensity. 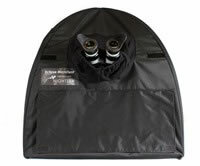 The light head hangers and cables are available individually or in combination kits. 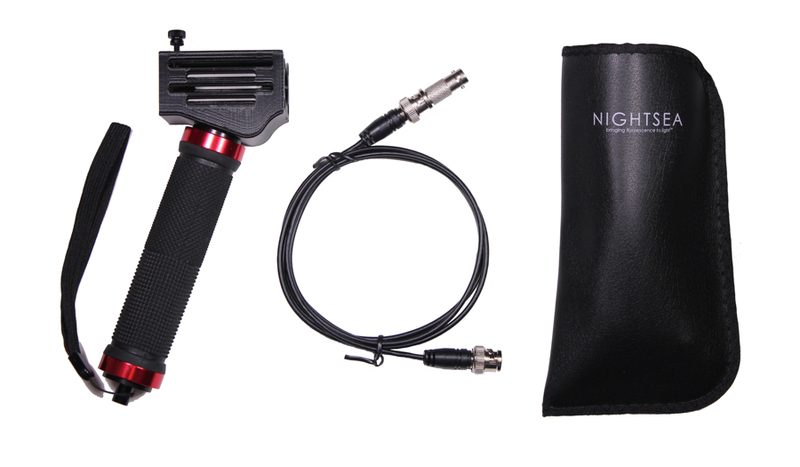 The Mobile Extension Kit provides added versatility to your SFA microscope fluorescence adapter system by enabling you to use the light head as a handheld light source. Do you work with both macro and micro subjects? Do you want to screen larger specimens before dissection or other microscope work? Can't fit everything under the microscope? Then the SFA-MEK Mobile Extension Kit is a way to get more use out of your system. Rubber-coated hand grip with wrist lanyard and custom made enclosure that holds an SFA Light Head securely. The slots on the side of the enclosure provide for cooling and also let you see the color code of an installed light head. To use the kit just take the light head off the SFA gooseneck base, connect it to one end of the extension cable, and attach the other end of the cable to the gooseneck. Insert the light head in the holder and screw down the thumbscrew to secure it in place. Put on the filter glasses that correspond to the light head color and you're ready to go! If you want to use the Mobile Extender with more than one excitation wavelength you can add additional barrier filter glasses at any time. If you want to use the Mobile Extension Kit with the SFA system you already own, then theÂ SFA-MEK is all you need. If you want to add additional excitation/emission combinations to use only for handheld operation and not for your microscope, you would need a Light Head plus a pair of Barrier Filter Glasses for each color. Easily change the lighting conditions while you work with the Switch Box Kit. Kit consists of a BNC switch box, 3 BNC cables (including one with a female to female adapter to attach to the gooseneck), and 2 Light Head Hangers. Only one control option is available per base. This DIM and PULSE options can be purchased as part of a new system, as a retrofit to an existing base, or in a stand-alone lamp base purchased a la carte. The DIM option adds a combined switch and dimmer control. When you first turn the unit on it is at full power. As you rotate the switch the intensity decreases, reaching about 30% power at the minimum setting. You have finer control in the brighter portion of the adjustment range. An intensity indicator (1-10) makes it easy to record and repeat preferred settings. The Model DFP Dual Fluorescent Protein Flashlights include two different, switch-selectable high intensity LEDs for excitation of fluorescent proteins. For years the most popular fluorescent colors have been green (GFP, eGFP, fluorescein, etc.) and red (DsRed, TdTomato, etc. ), and we offered only one version of the DFP, with a combination of blue and green LEDs for exciting these fluorophores. This is still our 'standard' DFP product, but we are now offering build-to-order combinations using any two of the excitation colors that are available with our popular Model SFA Stereo Microscope Fluorescence Adapter. 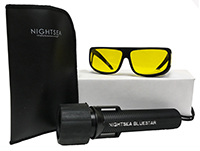 The BlueStar uses the latest in high intensity LED technology combined with specialized optics to produce an ultra-tight, ultra-bright 10-degree beam pattern for maximum excitation of fluorescence. Styles 1 and 2 fit over eyeglasses, Style 3 does not. Glasses meet ANSI Z87.1 impact standards for safety glasses.